Woman724: Super African Mangoes? May lose 8.9 Pounds and 2 Inches in 28 Days? Super African Mangoes? May lose 8.9 Pounds and 2 Inches in 28 Days? They claim by taking African Mango Plus just a few times per day, you will see your body transform like you never thought possible! Wow, really tempting and very so inviting? Over the years I had to please many friends having to buy from them all sorts of “wonder” health supplements, could this be one of those advertising gimmicks? Okay, hang on everyone, my close friend is living in Nigeria, close enough to Cameroon, I will try to get her to check with the local Africans there and update later on her personal views. 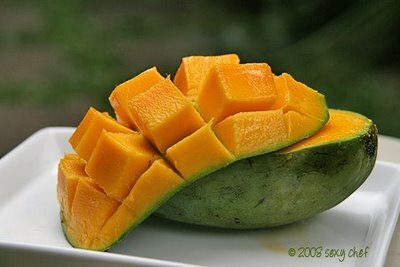 Interested to know more on African Mango go here and here. 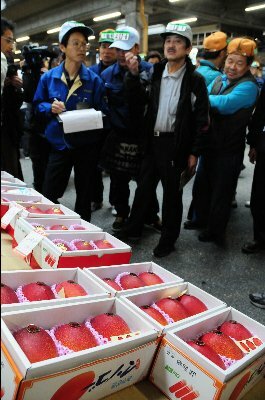 ...A pair of Japanese mangoes known as “Eggs of the Sun” for their fiery colour and juicy flesh hatched a sweet deal for their owner on Thursday, fetching a record 2,000 dollars at auction.. Interesting read here. One of my favourite local mango varieties is still the “harumanis”. However it is so difficult to find them in Kuala Lumpur. Even during my visits to Kangar not always lucky to find any. Where have all our harumanis gone to? A Happy Belated New Year Wishes to all, may this year bring lots of happiness to all.. the very best..stay fit and healthy! nak makan mango makan aje lah. tak payah nak masukkan health reason (chuckles). Mango ni bukan sebarang mangga..kalau ada jual kat Msia, hari2 saya akan beli! Wooosh seronok betul sekirany benar, adalah weight watchers magic fruit. Kalau dapat benih saya pun nak tanam belakang rumah! 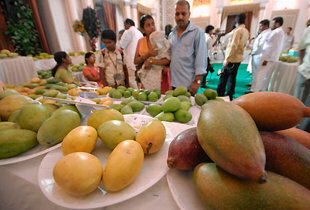 hi katrina, interesting african mango variety, amazing if it really works..
harumanis variety- love it too..
You definitely dont need this mango, lucky you! I miss all the food, these days makan pisang pun kena kira calorie intake! Huh! Nik was back here last Nov/Dec and supposed to meet, as usual, chipsmore, been planning so many times but both being too busy to meet up. She shld be back again this March or April. Must korek2 fm her to bring back some of these Mangoes! Cheers and a belated Happy New Year to you..
African Mango is the sensational new diet which has just arrived in Australia from the USA. It has been absolute revelation in the USA and is now set to change the face of weight loss in Australia. This diet has been passed down from generation to generation in Africa but now the cat is out of the bag! Sexual Abuse – Justice for victims?